In this April 21, 2018 photo provided by Rachel Wasser, Walmart greeter John Combs works at a Walmart store in Vancouver, Wash. Combs, who has cerebral palsy, and other greeters with disabilities are threatened with job loss as Walmart transforms the greeter position into one that’s more physically demanding. Combs was devastated and then angered by his impending job loss. 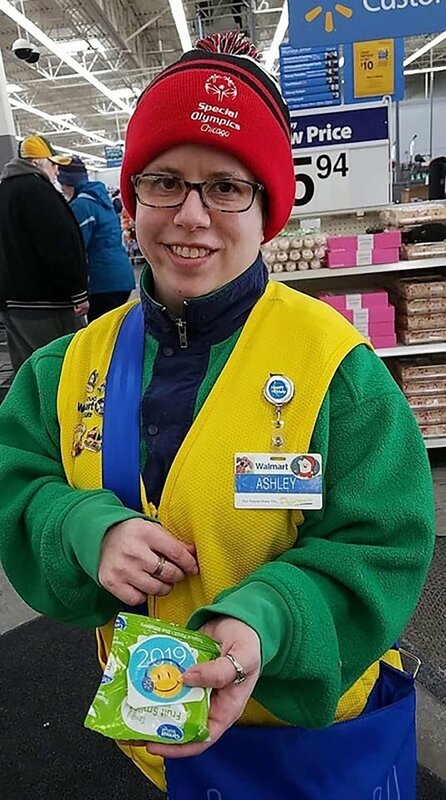 In this Feb. 21 photo provided by Tamara Ambrose, Ashley Powell poses for a photo at a Walmart store in Galena, Ill. Powell and other greeters with disabilities are threatened with job loss as Walmart transforms the greeter position into one that’s more physically demanding.